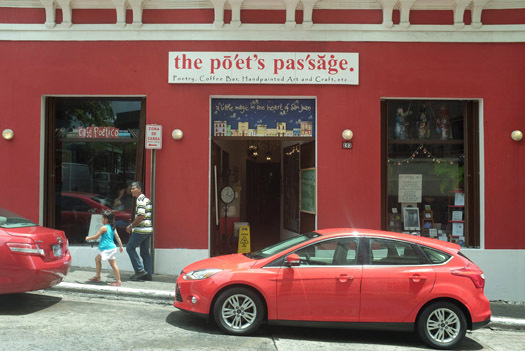 The Poet’s Passage is a spot every community should have. Darned if it isn’t in Puerto Rico. 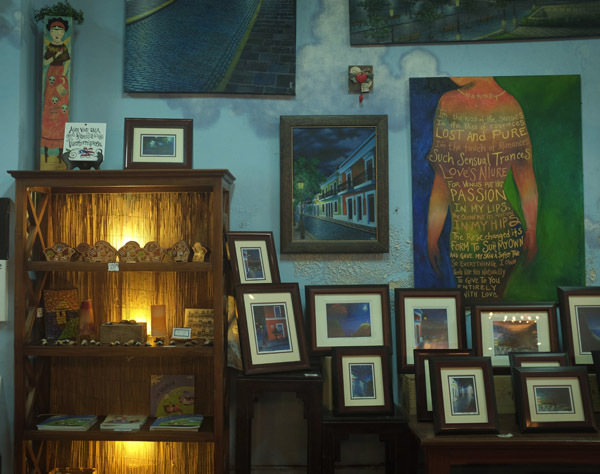 The shop, part coffee shop, part art store, part living room for the little old city, sits beside the little old supermarket on Calle de la Cruz in Old San Juan. All the streets in Old San Juan are cobbled in bluish stone called adoquine that arrived in Puerto Rico as ballast on Spanish ships in the 1500s. The light from shop windows makes the streets glow indigo in the frequent rain at night. One half of The Poet’s Passage is a coffee shop, with drinks like the Metaphor café latte, or the espresso (of course, called a Haiku), or the Rhyme, a latte with vanilla, almond and caramel. There are comfy chairs, a wide window to look out on the plaza, and pastries. Across a hall is the poetry shop, with paintings, poetry in calligraphy and on ceramic tiles, poetry books and sculpture for sale. 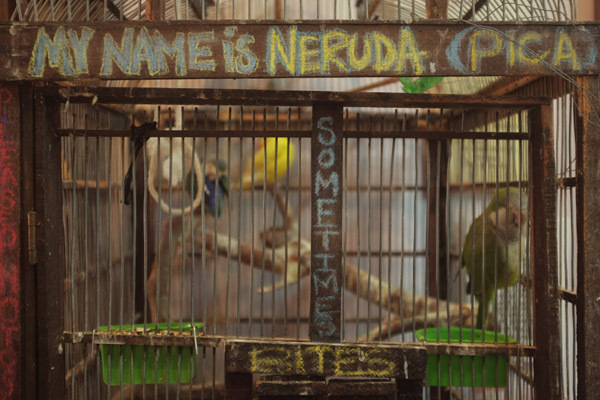 There’s also a chatty parrot named Neruda who sometimes nips. 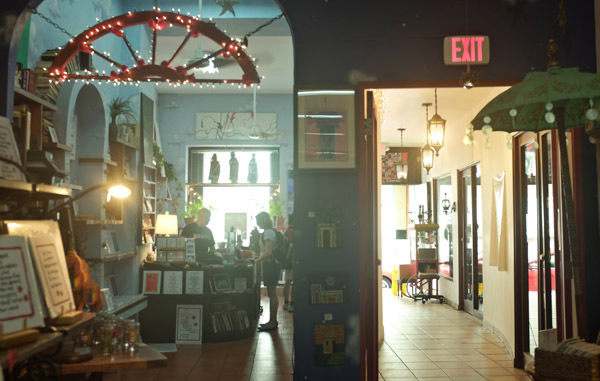 Every Tuesday night, the shop hosts an open mic poetry reading, usually with music, and sometimes the event spills out into the plaza across the street. One reading in March drew almost 2,000 people, then they had to move it indoors at midnight and it stretched on until 3 a.m.
Just beside the main, but tiny, supermarket in Old San Juan, The Poet’s Passage is owned by Lady Lee Andrews, a poet with three books published (Naturally, Changing and True Love), and her husband Nicolas Thomassin, who paints lovely images of the doors, landscapes and cobbled streets of Old San Juan and sells the prints for reasonable prices. He also makes the miniature plaster doors in the rainbow sherbet colors of Puerto Rico. Old San Juan is the kind of place that on Easter Sunday afternoon, hundreds of people from the town turn out to fly kites on the grounds of the El Morro, the sixteenth-century Spanish citadel built to guard the Caribbean. It’s also the kind of place that values poetry enough to keep a poetry store in business. 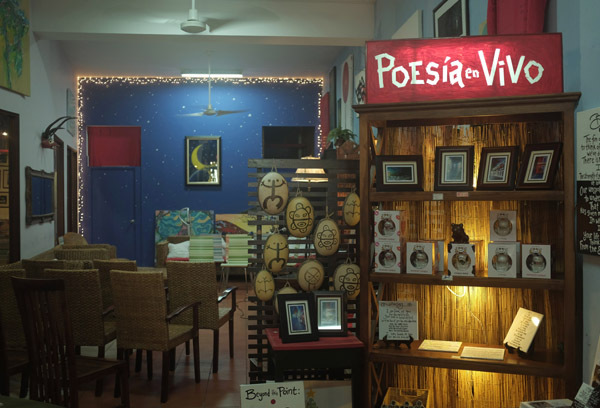 The Poet’s Passage feels like a community hub – the kind of organization that HoCoPoLitSo seeks to be. If only we had the Puerto Rican trade winds and sunshine. By hocopolitso in Guest post on April 17, 2013 .